In this Aug. 28, 1963 file photo, President Kennedy stands with a group of leaders of the March on Washington at the White House in Washington. Immediately after the march, they discussed civil rights legislation that was finally inching through Congress. 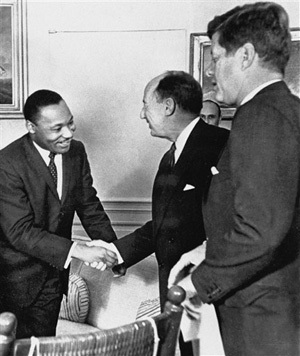 From second left are Whitney Young, National Urban League; Dr. Martin Luther King, Christian Leadership Conference; John Lewis, Student Non-violent Coordinating Committee, partially obscured; Rabbi Joachim Prinz, American Jewish Congress; Dr. Eugene P. Donnaly, National Council of Churches; A. Philip Randolph, AFL-CIO vice president; Kennedy; Walter Reuther, United Auto Workers; Vice President Lyndon B. Johnson, partially obscured, and Roy Wilkins, NAACP. Photo Credit: The Associated Press, File. As Americans reflect on the legacy of Martin Luther King Jr., an audiotape of an interview with the civil rights leader discovered in a Tennessee attic sheds new light on a famous phone call John F. Kennedy made to King's wife more than 50 years ago. Historians generally agree that Kennedy's phone call to Coretta Scott King expressing concern over her husband's arrest in October 1960 - and Robert Kennedy's work behind the scenes to get King released - helped JFK win the White House a month later. King himself, while appreciative, wasn't as quick to credit the Kennedys alone with getting him out of jail, according to a previously unreleased portion of the interview with the civil rights leader days after Kennedy's election. "The Kennedy family did have some part ... in the release," King says in the recording, which was discovered in 2012. "But I must make it clear that many other forces worked to bring it about also." A copy of the original recording will be played for visitors at the National Civil Rights Museum in Memphis, Tennessee, for a "King Day" event on Monday. King was arrested a few weeks before the presidential election at an Atlanta sit-in. Charges were dropped, but King was held for allegedly violating probation for an earlier traffic offense and transferred to the Georgia State Prison in Reidsville, Georgia. The Kennedys intervened, and King was released. Their intervention won the support of black voters who helped give Kennedy the winning edge in several key states. Despite their help, however, King was careful not to give them too much credit. "I think Dr. King was aware in the tape that he probably did more for John F. Kennedy than perhaps John F. Kennedy did for him," said Keya Morgan, a New York-based collector and expert on historical artifacts. Morgan acquired the reel-to-reel audiotape from Chattanooga, Tennessee, resident Stephon Tull, who discovered it while cleaning out his father's attic. Raymond Winbush, director of the Institute for Urban Research at Maryland's Morgan State University, said Kennedy's call to King's wife was political in nature because the Kennedys had been slow to get involved in the civil rights movement. Winbush said John Kennedy didn't actually commit to the movement until a few months before his assassination when civil rights leader Medgar Evers was gunned down by a Klansman outside his Jackson, Mississippi, home just after midnight on June 12, 1963. The slaying came hours after JFK's television speech in support of civil rights and helped propel the struggle for equality to national attention. "There were a lot of black folks who ... weren't fully committed to his campaign," said Winbush, who is also a historian and psychologist. "That call he made to Coretta moved black folks." At the time, the Republicans - the party of President Abraham Lincoln - enjoyed more black support than it does today, in part because the Democratic Party included white southern lawmakers and governors who supported racial segregation. Winbush said King's comments on the tape were measured because he probably didn't want to offend black supporters, like the National Association for the Advancement of Colored People, a leading civil rights organization, that had also aided him. "He kind of went in the middle," Winbush said. Tull, the Chattanooga man who discovered the tape, said his father had planned to write a book about the racism he encountered growing up in Chattanooga and later as an adult. Tull said his dad, an insurance salesman, interviewed King when he visited the city, but never completed the book and just stored the recording with some other interviews he had done. Tull's father is now in his late 80s and under hospice care. Tull has asked that his father not be identified. In the recording, King also discusses his definition of nonviolence, his visit to Africa and the impact of the civil rights movement. "I am convinced that when the history books are written in future years, historians will have to record this movement as one of the greatest epochs of our heritage," he said. After Morgan acquired the tape, he sold it to magician David Copperfield, who then donated it to the National Civil Rights Museum to promote King's message of nonviolence. Copperfield said King inspired people to dream. "That's too important for one person to possess," Copperfield said of the recording. "You have to share that with people to remind as many people as possible of the message." Barbara Andrews, the museum's director of education, said she's pleased the museum's visitors will get a chance to hear the recording, which will be among the exhibits at the newly-renovated facility scheduled to fully open in April. "It's so powerful for us to be able to hear Dr. King in his own words again so many years after his death," Andrews said. "And I think for our visitors to be able to hear him say these words again will resonate in ... a way that we could not convey third person."